Welcome to Cloudeight InfoAve Premium issue #806. Thank you very much for subscribing and for being a part of our Cloudeight family. We appreciate your friendship and support very much! LAST WEEKEND FOR THIS SALE! Spring is here and we're celebrating by bringing back one of our most popular sales ever! We're giving you the option to choose what you pay for some of our most poplar products & services. I just want to thank you Darcy and TC for helping me with my computer. You two fixed my computer and it is running so nice now, I really appreciate what you have done and especially to find that my Microsoft if not corrupt. There are some people out there that pray on people like me that rely on some one to fix things up. The repair man I had, am now thinking, fixed things up so that I would have trouble and have to call him to come and fix things. Money in his pocket. Now with TC and Darcy I will always call on them if I have a problem, they know what they are doing so please, people out there, give them a try at Cloudeight and you will not be sorry. Two people who know what they are doing and your computer will run like a clock. Just cannot say enough for these two so grateful for what they have done. I had Darcy connect to my computer this morning. I want to tell you that watching her work is amazing. I've previously had TC work on my other laptop and the Cloudeight people are the only ones I will ever allow to fix my computer. Over many years they have proven that that they are trustworthy, knowledgeable, and friendly. After my session was over and Darcy had completed her work, I asked her if I could ask a couple questions. She was kind enough to spend extra time answering my questions. Cloudeight is the best. Thank you, Darcy. Thank you so much TC for your very quick and informative reply to my recent inquiries. I always appreciate your wisdom and honesty and you guys are the only ones I have trusted since I started using a computer back in 2001. A big Cloudeight "Thank you!" to Uwe, Audrey, Rachel, Marilyn, Nora and everyone who took time out to write to us. We appreciate your kind words and your support very much! EB & TC. Windows update automatically updated last night and it said it failed to update 2019-03 Cumulative update for Windows 10 version 1809 for x64 based system KB4489899. Do I need to do this myself now or is this something that needs to be updated? It mentioned all kinds of problems that could happen if I updated it. (Hate updates) but if it needs to be done, what do I need to do? Hi Joyce. This is not a version update, it's just an update to Windows 10 version 1809. It's not unusual for a schedule update to fail; Windows Update will try to update again on its own schedule. If it were my computer, I wouldn't worry about it, I would wait until Windows Update tried to install it again - usually the second attempt will succeed. As far as people reporting problems with an update, this will always be the case. With tens of millions of users, there will always be update issues unfortunately. But installing updates is the only way to keep Windows 10 safe, secure and protected from any newly discovered exploits. -- Addresses an issue that may cause users to receive “Error 1309” while installing or uninstalling certain types of MSI and MSP files. -- Addresses an issue that may degrade graphics and mouse performance with desktop gaming when playing certain games, such as Destiny 2, after installing KB4482887. -- Security updates to Microsoft Edge, Internet Explorer, Microsoft Scripting Engine, Windows Shell, Windows App Platform and Frameworks, Windows Kernel-Mode Drivers, Windows Server, Windows Linux, Windows Hyper-V, Windows Datacenter Networking, Windows Storage and Filesystems, Windows Wireless Networking, the Microsoft JET Database Engine, Windows Kernel, Windows, and Windows Fundamentals. --If you installed earlier updates, only the new fixes contained in this package will be downloaded and installed on your device. Make sure you select 2019-03 Cumulative Update for Windows 10 Version 1809 for x64-based Systems (KB4489899). The download button is to the far right. Our advice? Wait a few days and see if the update installs by itself. Joyce wrote back: "Thanks, thanks and thanks again for responding back. You guys are so helpful and kind and know how to relieve the stress for this lady. Joyce"
First, it will be helpful for you to put Copy to / Move to on your Windows Right-click menu. To do that, follow the easy steps on this page. Once you've done that, create a new folder on your computer and name it Google Photos or something to help you identify it. and remember where you put it. Then download all your pictures from Google Photos. Once you've done that, then you can copy them to your USB flash drive. Select Download and choose the folder you created above to download them to. Once done, you can copy the photos from your computer to the flash drive by selecting all the photos you downloaded from Google Photos by going to the folder to which you downloaded them, select one of the photos then press CTRL+A to select them all. Once they are all selected, right-click on the selected files and choose "Copy to" and choose your USB flash drive. If you want, you can copy the photos from Google Photos directly to your USB flash drive or external drive, although I recommend you put them all in a folder on your hard drive first. I don't know how many photos you have, so I can't really guess how big of a USG flash drive you'll need. You can purchase a 32 GB USB flash drive for less than $15 and it will hold over 3000 photos. If you have more than 3000 then you'll need a bigger drive. You can buy a 1 TB External drive for less than $60 - and it will hold 50,000 or more photos. Kathy wrote back: "This is great, thank you so much! You've provided another perfect solution to save my dwindling patience. Kathy"
this is a simple issue but one that has puzzled me for a long time. I was looking at the 2018 e-book. ON the first page, second paragraph, it states that the shift key enables the lower command when there are 2 commands on one key. The ? and / key were used as an example. On my keyboard and every keyboard I've ever had or used, the shift key enabled the upper command which is the question mark. I would not use the shift key for the slash. Am I misunderstanding the whole thing? Hi Jean. It's not the shift key it's the Fn key, but it only applies to laptops. Desktops don't have Fn keys. Most desktops have full size Keyboards, many laptops do not. The Fn key is also called the function key which allows more functions for laptops that have smaller keyboards and thus fewer keys. Jean wrote back: "Thank you, TC. Jean"
Hardware is any physical electronic device. Computers, laptops, printers, wireless adapters Ethernet cables, speakers, hard drives, keyboards, monitors, are all examples of hardware related to computers. Software is broad term for programs than run on hardware. The most familiar types of software are operating systems, like Windows, and applications, which are programs designed to do a particular job. Software resides on hardware and runs from memory when started. Drivers are also software. Drivers usually, but not exclusively, control hardware and are loosely related to firmware. Firmware is software, but it's a more specialized type of software that is semi-permanently installed in a hardware device. It remains in the hardware even when the hardware is powered off. Firmware is very memory efficient and the memory it uses is very fast, and that makes firmware ideal for controlling hardware devices where performance is key. An example of a device that uses firmware is a router. Almost all routers use firmware. Routers can be updated by installing new firmware. Thanks for your support and your kind words, Cheryl. Cheryl wrote back: "As usual, Mr. TC, your answer is exactly what I was looking for. Thank you. Cheryl"
Hi Aria. According to Microsoft, as of March 1, only about 25% of Windows 10 users have been updated to version1809. It is still rolling out slowly. Some folks in the know think that many will never get version 1809 and they will go straight to version 1903 which is scheduled for release in April/May 2019. As you know, there were a lot of problems with version 1809; it was released and then pulled from distribution due to serious flaws. It was originally released on October 5, 2018 and then re-released on November 13, 2018. So if you haven't gotten version 1809 yet, you're not alone, in fact you're in the majority. Aria wrote back: "Thanks, TC. Have a nice day. Aria"
I just noticed a program that I know nothing about on my PC. It's called software995. Is it adware or something like that? Also how do I get rid of it since it does not show as an installed program. It is just on my list of Program when I search for program on the right side of my PC when I go to the Windows icon. Hi Norman. Since I can't "see" your computer, I'm going to venture a guess. Software995 is a web site that distributes a questionable program called PDFEdit995. It's likely you installed PDFEdit995 from Software995 and when you did, Software995 put a link to their web site in your start menu. You can remove the Software995 entry in your list of programs by right-clicking and removing it - there is nothing to uninstall since it's a link to a web site. You can remove PDFEdit995 (if installed) by typing Control in the taskbar search. Press Enter when you see Control Panel appear at the top. In Control Panel, click on Programs > Uninstall a Program and look for PDFEdit995. When you find it, right-click and uninstall the PDFEdit995 program. Norman wrote back: "That did it. Thanks!" Hi. I got my first used computer in 1999, I believe that it was windows 95. I signed into to the internet for the first time with AOL. I believe it was around 2000 when I found your web site. I signed up for your stationary and emails shortly after. Thank you for all of your tips and tricks over the years. I have learned so much from you. There are not too many good people out in cyber land that I can trust. You are at the top of my trust list. Now for my slight problem. I never received the windows 10 October update 1809. My last update was May 2018, 1803. Everything is good to go in my computer as far as the updates are concerned. I have received several notifications from Microsoft stating that my update was going to be downloaded shortly, but the download never happened. My last windows check was yesterday, March 19, 2019 at 6:30 pm and it says that I am up to date. I don’t understand how that could be as I never received the October 2019 update. Now the Spring update is not too far away. The following are updates that I received on March 19, 2019 for version 1803. Cumulative, Security update for Adobe Flash Player and an update for Windows 10. Please advise me what to do. Andrea. Hi Andrea. Thanks so much for your kind words and your support. Let us put your mind at ease - about 75% of Windows 10 computers, as of March 19, 2019 are up to date, yet have Windows 10 Version 1803. This is because of the rollout of the October 2018 being stopped after five days because it was causing some users to lose all personal data. It was not until five weeks later, on November 13, 2018 that Microsoft restarted the rollout of Version 1809 and then at an intentionally slow rate. So, actually you're in the majority - most Windows 10 users don't have Windows 10 Version 1809 - only about 25% do. Yet all those who have Version 1803 who have installed all the cumulative updates from Windows updates over the weeks and months since Version 1809 was released are technically up-to-date. With the April 2019 Update - Version 1903 - coming in the next month or two, there's a really good chance that many Windows 10 users will go right from Version 1803 to Version 1903 without ever installing Version 1809. Version 1809 is not a prerequisite for Version 1903 and 1903 has all the features of 1809 plus some really nice new features. So, officially you can be up to date if you're still using Windows 10 Version 1803. And you're not alone, about 3/4 of all Windows 10 users have not been updated to Version 1809. Our advice, don't worry, be happy. If you go right from Version 1803 to Version 1903 this spring, you'll be fine. And once Version 1903 gets close to rolling out, we'll be covering the new features of version 1903. But don't get too excited, there are no earth-shaking new features that we've seen in the test versions of 1903 we've seen - but there are several nice changes coming. Spring is here, and we're celebrating by bringing back one of our most popular sales ever! We're giving you the option to choose what you pay for some of our most poplar products & services. Microsoft has declared that Windows is now a ‘service’ and as such it will receive major ‘version’ updates twice each year. It was not always so, but now we all now moseying down that path. It’s a good time to review the versions of Windows 10 that have been released thus far because soon you won’t be able to tell the players without a scorecard — and you know what we mean! Keep in mind that (according to Microsoft) each version update of Windows will be supported by for approximately 18 months after its release date. This means that Windows 10 versions 1507, 1511, 1607, and 1703 have now reached their end-of-life dates and, according to Microsoft, will not receive any further updates. Version 1803: Also known as April 2018 update. It was released on April 20, 2019. Version 1809: The October 2018 update was originally released on October 5, 2019, however, Microsoft stopped distribution after serious problems were discovered. Version 1809 was then re-released on November 13, 2018. It is still rolling out and as of March 1, 2019, only about 25% of Windows 10 users had been updated to Windows 10 version 1809. Version 1903: Windows 10 version 1903 is expected to be released in April or May of 2019, but as of today, no official release date has been announced. Those who have not been updated to Windows 10 version 1809 yet need not worry. 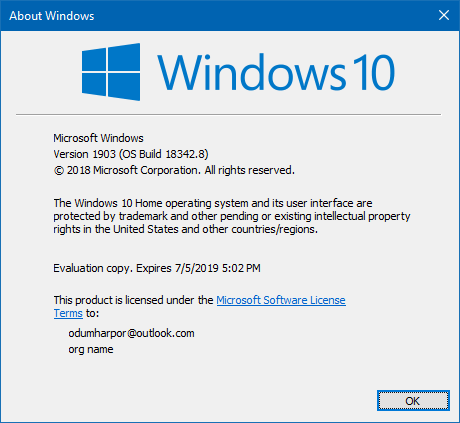 Version 1809 is not a prerequisite for Windows 10 version 1903. Windows insiders have been testing version 1903 for several weeks now. So far, we like it. But will you? Only time will tell! According to Microsoft you can reinstall Windows 10 on any computer that has previously had Windows 10 installed on it without having to enter a Windows Product Key. But if you're the kind of person who likes to cover all your bases, here's an easy way to get your Windows 10 product key without using any 3rd-party programs. a. Type CMD in taskbar search. When Command Prompt appears at the top of the search results, right-click it and choose "Run as administrator". Your Windows 10 product key will be immediately displayed (see screenshot below). Make sure you copy or write down the product key and keep it in a safe place - just in case. 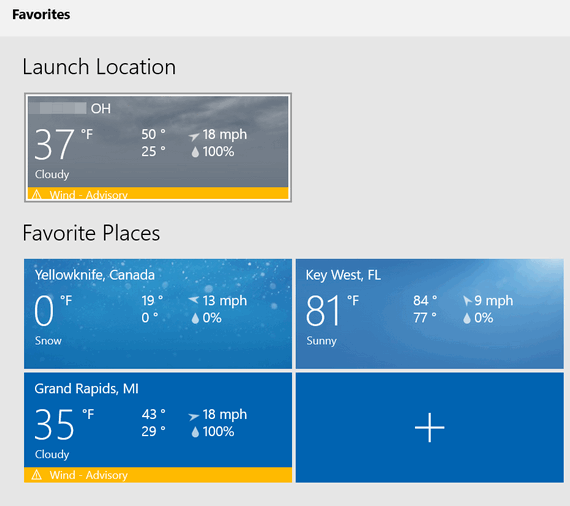 Recently, we had a couple of people ask us to recommend a good weather program for Windows. Both of these folks were using Windows 10 and neither were aware that Windows 10 comes with a very nice Weather app. It’s as good as, or better than many 3rd-party apps such as the ones offered by Weather.com and Accuweather. And there is nothing to download or install because it comes with Windows 10. 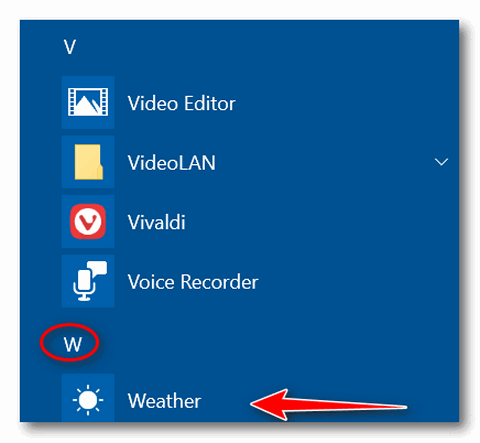 If you have never used the Windows 10 weather app, you’ll find it on your start menu under “W”. 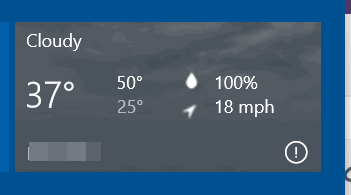 You can also type WEATHER into taskbar search to open the Weather app. Once you open it, you’ll need to configure it – and there’s not much to configure. You can choose a color mode: “Light”; “Dark” or “Windows default”. You can try each of them all and find the one you like best. If you’re in the USA, you’ll want to choose “Fahrenheit” unless your a masochist, a mathematician, or you were born & raised somewhere else. If you’re from most anywhere else in the world, you’ll want to choose “Celsius” . This also changes other items such as wind velocity, barometric pressure, et. al. to metric. 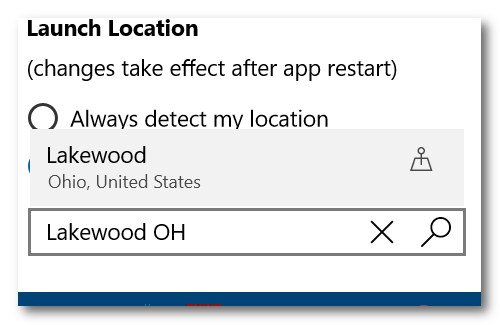 If you want to let Windows detect your location (you must have “Location” in “Settings” turned on), leave it set to default. 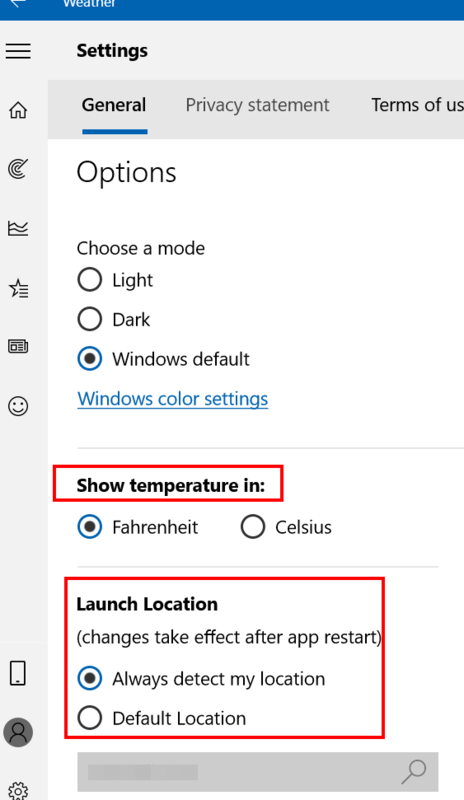 If you don't have or don't want to turn "Location on in settings, you can choose “Default location”. Once you choose “Default location”, just type in your city’s name or zip code. 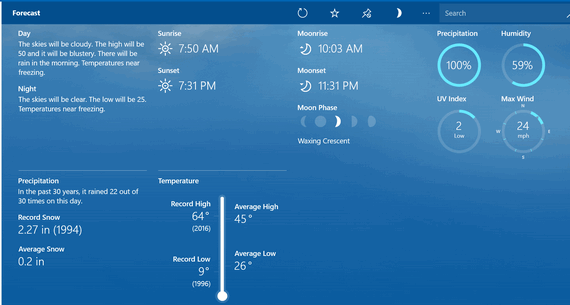 Once you’ve set up the Windows 10 weather app, you’ll see your weather forecast for the day, for the next 10 days, with a lot of details including an hourly forecast for the current date. Weather warnings show up in a yellow band across the top. You’ll also see wind direction, velocity, barometric pressure, current temperature and more on the main screen. You can see the detailed forecast for the each day. On the daily details screen you will also see the sunrise/sunset times, moon phase, moonrise/moonset, times chance of precipitation, humidity, UV index, and Max Wind speed. You’ll also see your historical weather such as the highest and lowest temperatures ever recorded for that date along with historical precipitation information. If you’re an icon aficionado, you can see more settings and features by clicking on the icons along the left edge of the program. If you prefer to see a more descriptive settings menu, click on the 3-horizontal bars at the top left. 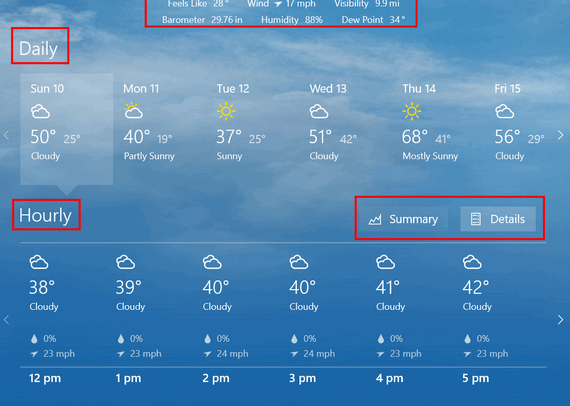 Another feature we like about Windows 10 Weather app is the ability to add more locations. If you have a favorite vacation spot, or friends or family members living in other parts of the world, you can add as many “Favorite” locations as you want and get instant current weather information about each “favorite”. 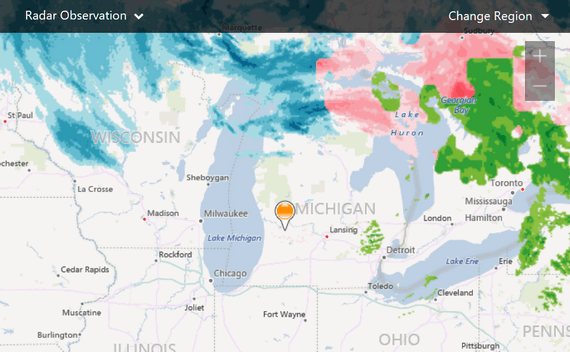 And if you click on any of your favorite locations, you’ll get detailed information and forecasts. 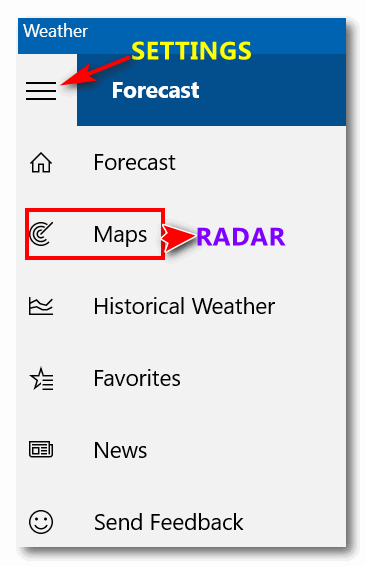 If you want to see your local radar, click on the Maps icon or “Maps” in the expanded settings menu. And you’ll get an animated radar image for your location – or for any of your “Favorites”. 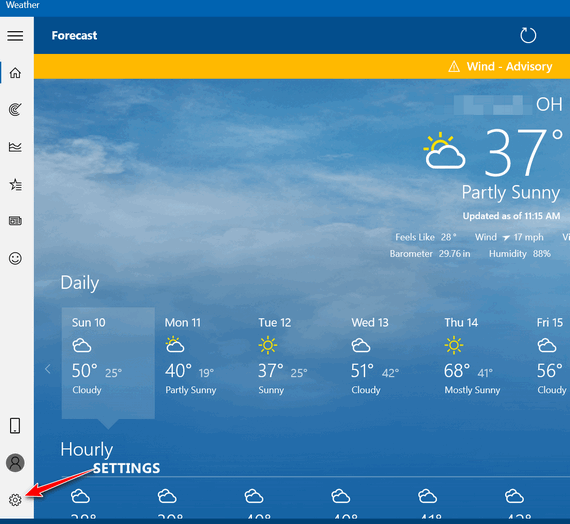 If you’re using Windows 10 and you are looking for a good Weather program, you won’t have to look too hard. There's a really good weather app already installed. Use it and you'll have weather at your fingertips. Protect PDF — Protect PDF files with a password. Encrypt PDF documents to prevent unauthorized access. 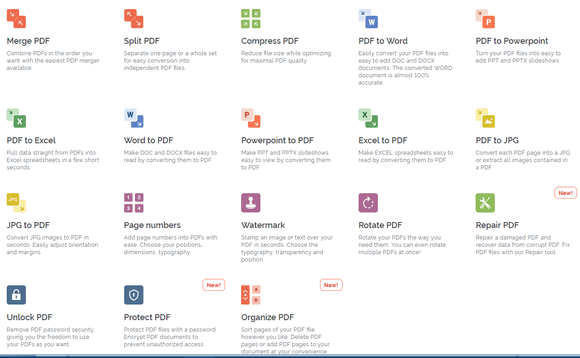 "Every tool you need to use PDFs, at your fingertips. All are 100% FREE and easy to use! Merge, split, compress, convert, rotate, unlock and watermark PDFs with just a few clicks." I don’t have much of a life, I guess. I’ve been waiting all winter to see some form of life spring forth from the cold, almost-still-frozen earth. Normally, the first things to spring forth are the crocuses, and most years these hearty little flowers start poking their heads up through the hard, brittle soil near the end of February. This year we’ve had an incredibly long, nasty, cold, brutal, snowy winter – I’m sorry for all the adjectives, but there’s just no other way to impress upon you how long and draconian this winter has been. Anyway – the crocuses didn’t poke their green shoots up in February – in fact, they barely were able to muster enough courage to make an appearance in March. On the 12th day of March, one courageous little crocus raised up his little green arms and broke through despite winter’s lingering icy grip. Many people think I’m nearly insane, and by the time I’m done, you probably will too; I cannot help what you or anyone else thinks, and what does it matter anyway? We are all in this thing together – I mean you are on the same short ride on this tiny globe spinning through space as I. Even when I’m sitting quietly in my broken-down recliner, watching Marcus Welby, M.D. reruns, I’m still traveling thousands of miles per hour – riding on this round blue bus through the blackness of space. The Earth spinning around on its axis; the Earth is orbiting the sun, and the sun is orbiting the center of the galaxy; the galaxy is moving through the universe, and all the while I’m sitting in my chair draining a cold bottle of Miller 64. Don't sleep in the subway... and don't type a URL in a Search box! We were doing a session the other day and we gave a customer a link to paste in their browser in order to connect for a Cloudeight Direct Computer Care session. The customer reported back to us that the link we gave her led to all sorts of sites, and none of them had anything to do with us or her session. Pasting links into a search engine can lead to some very bad things. After some investigation we determined that she was pasting the link we gave her in the search bar of her browser instead of the address bar. And what a difference that makes. Most email clients and webmail let you click the link we send. 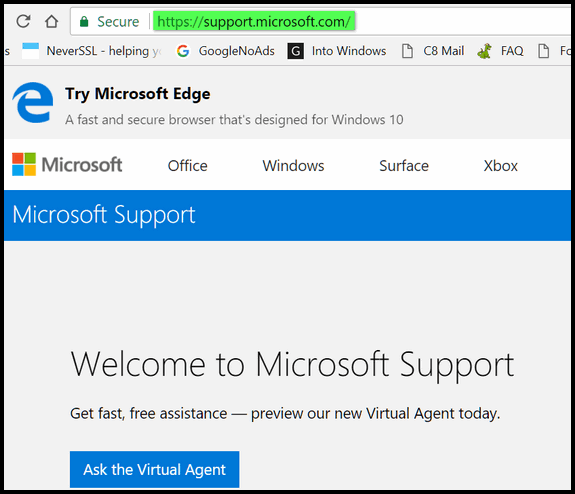 If you click any of those you might find yourself smack dab in the middle of a Microsoft support scam, we tells ya. 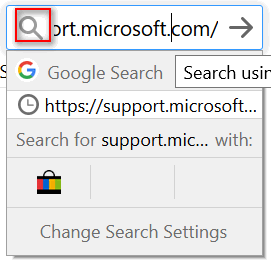 If you type https://support.microsoft.com/ in a browser search bar (see below), you could end up steering yourself right in to a scam (see above). But when you type the URL (Web address) into the browser's address bar (see screenshot below), you'll end up on the correct site and save yourself oodles of potential problems. See? Typing in a site's URL (Web address) into the browser's address bar instead of the search bar, means you'll more likely end up on the right site - assuming you type the address correctly - always double check! Bonus: If you're using Windows 10, the safest way to get help from Microsoft is to get it right from your Windows 10 PC. See our article here to find out how to do that.